It is with profound regret that Pearl’s family announces her passing in Queens General Hospital, Liverpool, on April 13 after a brief illness. Pearl was born in Chelsea, Lunenburg County, on July 23, 1929 to the late T. Raymond and Ella (Baker) Uhlman. Pearl was one of a large family, this family being very near and dear to her, her entire life. Pearl loved to recall and recount stories of growing up in such a large family. 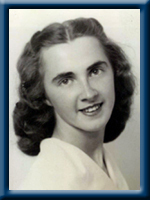 When the family moved to Bridgewater in 1942, Pearl was able to continue her education and eventually complete high school. She went on to take a commercial secretary course and found employment as a secretary and enjoyed that job very much, until moving to Brooklyn. Pearl married Stephen (Tim) Golden in 1950 and they raised three children. Pearl was a member of the Brooklyn Baptist Church, previously a member of Chelsea Baptist and Bridgewater Baptist. Pearl’s second family was her Church and her faith. Over the years the Brooklyn Baptist Church has been Mom’s home away from home and as she slowed down in her later years, one place she would strive to get out to was Church and church functions. She particularly loved to sing in the choir, bake for church socials, and serve as Sunday School teacher. In later years, the rebirth of the church with young families coming out brought joy to her heart. Pearl liked to knit, sew, cook, bake, read, play cribbage and spend the summer months at the cottage on Labelle Lake in Labelle, Queens County. A recent trip to Greenfield and area to see the changes there left Mom in awe at how the quaint little village has grown. She had so many questions as we drove around and had a smile on her face. The strength and resilience of rural communities always impressed her. Pearl is survived by her children Roderick and Ann Golden(Hebbville) Sandra and Jack Kyte (New Glasgow) Greg Golden (Charlottetown), grandchildren Michael Golden (Berwick), Craig (Lisa) Golden (Bridgewater), Laura (Don) Chisholm (New Glasgow), Denise Kyte (Toronto), Jeremy (Tara Coolen) Golden (Halifax) and Kira Golden (Hammonds Plains), great-grandchildren Hailey and Olivia Golden, Will and Cole Chisholm, Alexandra Coolen. Also surviving are Pearl’s immediate family members Freda and Francis (Brooklyn), Dona (Bridgewater), Wilson (Lunenburg), Ronald (Pleasantville), many, many nieces and nephews. Pearl was predeceased by her husband Tim and immediate family members: Vivian, Yvonne, Margaret, Annie, Donald, Joyce, Garth, Aubrey, Robert, Marion, Betty, Ronnie. The family would like to thank Dr. Susan Thorne for her care and compassion over the years and the staff at Queens General Hospital, whose care and kindness will forever be in our memories. As well, thank you to Pastor Steve and Pastor Marie for their kindness and support during our time of grief. So sorry to here of your mom’s passing. I send my thoughts and prayers to all the family. Rod (Ann) and Families- We were very sorry to hear of your Mother’s passing. Please accept our sincerest condolences. Our thoughts and prayers are with you during these difficult times. We send our deepest and most heartfelt sympathy on the loss of your Mother and Grandmother. May your fond and loving memories of her carry with you in the years ahead. My thoughts are with you and your family at this time, Greg. Our deepest sympathy on the passing of your mother and grandmother. Our thoughts and prayers are with you during the days ahead. Pearl was a wonderful woman, and we are thankful to have been able to share Christmas, Easter and Thanksgiving Dinner with her over the last few years. Cherished memories we will hold close to our hearts. Roderick and Ann, Dwight and I are sending our condolences to the family. We did not know your Mom but she seemed like a lovely lady giving so much to her community, My mom lives in Chelsea also. Moms mother in law was a Ulhman, perhaps some relation.Our thoughts are with you both at this sad time. ending with a big smile >She will truly be missed . Pearl was a wonderful kind lady. She always asked about our daughter whom she taught in Sunday School several years ago. She will be greatly missed. Take comfort in your memories and in knowing she is at peace with our Lord. We are so saddened to hear of your Moms passing,She was a great person as was your Dad.She will be missed by everyone who had the pleasure of knowing her.I had many visits to their home while I worked with VON,and had a great talk with her not too long ago.Our condolences to you all.You are in our hearts and prayers at this sad time. sorry to hear of your mom passing our thoughts are with you all . So sorry to hear about your mom. She was a great lady and will be deeply missed. Hugs coming your way. Accept my prayers and sympathies at this time of loss. Brooklyn has become a little dimmer and heaven that much brighter. I will miss Pearl. I would like to extend heartfelt sympathy to the family of the late Pearl Golden. I am very saddened to hear of your loss. Your family is in my thoughts and prayers. I send my deepest condolences to the family, I have many memories of your mom and enjoyed talking to her,you are all in my thoughts and prayers at this time….She will be missed take comfort in your memories.. I am sorry for your loss. While I only meet Pearl once, it was a pleasure to meet her and visit with her and you at her home. She did a great job raising her children to become the great individuals that they are today. I’m sure she remains proud of you all as you continues to watch over you. Rod, Sandra, Greg, and families. Please accept our sincere sympathy. You are remembered in our prayers and trust you will find comfort in your memories. God Bless. Liverpool members of the Uhlman clan more often. Our visits with Pearl were always a pleasure and her smile always lit up the room. It was wonderful to see her just before the end…..still smiling and cheerful. A wonderful person and a very special Aunt. Sorry to hear of the passing of your mother and our aunt. We didn’t get to see much of each other but your mother and your family were thought of often. So very sorry about the passing of your sister Pearl. Please accept our deepest sympathy to you and your families. It was so nice to read of your sister Pearl’s outing to the country and that it gave her such pleasure. The community in which she was born and grew up in has changed through – out the years and I am sure she had such wonderful times and memories of her own, that she shared with you all. Keep those memories of hers and yours of your childhood days up into adulthood close to your hearts. Rod,Ann annd family I am sorry to hear of your loss I am sure she will be missed by all who knew her. I am so so sad to hear of Pearl’s passing. Her’s was always one of the first faces I looked for every year when visiting my Dad and coming to church. She was a beautiful lady, both inside and out. I will miss her and my thoughts and prayers are with all of you at this time. So very sad to hear of your mother’s passing. May God bless. sorry to hear of your loss.It leaves a real void when the Mother passes on ,but we learn to live in our memories. Please accept our heartfelt condolences, may you find comfort in the loving memories of your mom and may the passage of time heal your grief. From our high school years and my visits at your home and at the cottage, I have fond memories of Mrs. Golden as a kind, sweet person. Thinking of you all throughout this week and especially on Saturday, Good Bless! So sorry for your loss . Pearl was my neighbor and a lovely lady. She will be missed. Our deepest sympathy on the loss of your Mom.